Visualising the path of customers along a particular goal flow. For example a 4 stage checkout visualisation will allow us to see where along the checkout process there is significant drop off. If stage 3 of the checkout has a significant drop from stage 2 then it is probable that there is something on stage 2 that is causing a customer to abandon this particular stage. Creation of two different layouts for the same page with differing page “calls to action” placements that will show which variation of the same page is converting better. increasing user interaction and engagement by the type of content that is shown and the frequency that the content is being updated. Once a name is given then a goal type needs to be defined from a list of 4 options. 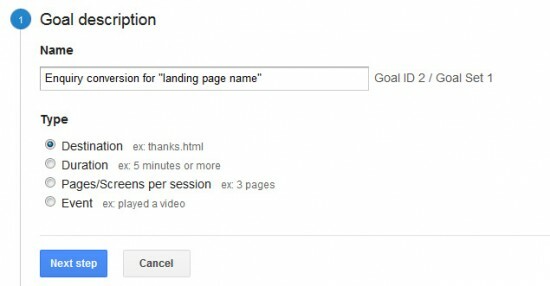 This option is chosen if the conversion has a goal completion page such as an order success page or an online enquiry success page. For our example this is the choice we would choose. Clicking ‘Next Step’ prompts you to give more specifics about the Goal. For our example we have selected Destination as the Goal Type. 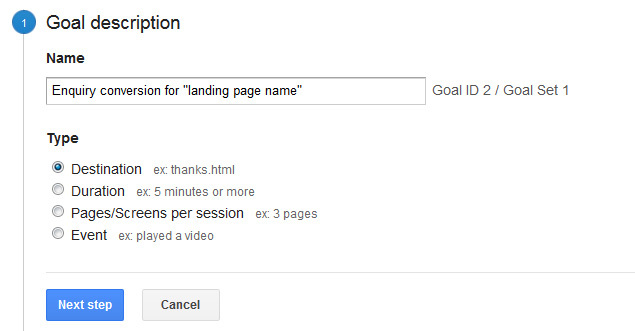 The first thing to specify is the ultimate destination page for the conversion. For our example it is the form submission completion page. This is not required for our example but if you were tracking the checkout process on your e-commerce website then you would define each individual checkout stage page from start to finish. Goals would then show the flow of the process and if there were abandonment spikes on a certain checkout stage. This can then be acted upon. Starting with the completion page, this tab gives you the ability to view how a user got to the point of your completion page. The reason that this could be potentially very useful is that users don’t always go from point A to D via B and C. This would show any unexpected path flow that the user took. If there were multiple instances of this certain unexpected path it could highlight a particular sticking point in the process. This allows you to see an overview of the traffic from points A to D. This is very useful for immediately seeing any abandonment or if there are unexpected paths that the user takes. 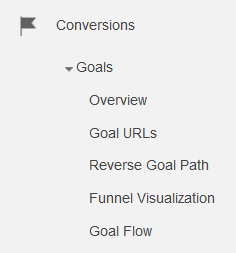 Goals are a very important part of your Analytics armoury to help understand how effective or otherwise key user activity is on your website. From this analysis changes and refinements can be made to help improve conversion rates on your website.